It doesn’t matter if you’re a college student or single parent, finding time to make some extra money can become stressful. Wouldn’t it be great if there were a job that actually let you work when you wanted to? If there were such a thing, you’d never have to worry about balancing your flexible work with more important priorities. Well, guess what? There is. Kaeser & Blair Promotional Products offers real, flexible work through a Business Owner Program that comes with generous earning potential and is easy to start. 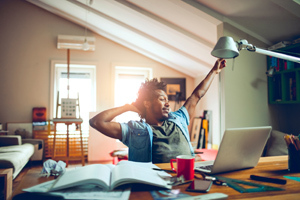 Now, you may be wondering how a Business Owner Program could ever be flexible work, but it’s much simpler than it sounds. As a Kaeser & Blair business owner, your job would merely consist of selling promotional products. Once you’ve placed an order, we will direct deposit profits into your bank account within 24 hours. Our flexible work model will also never ask you to buy or store any inventory. Instead, we’ll send the products directly to your customer after the order has been placed. Your “Business Owner” title simply comes with the freedom of being your own boss. When you join Kaeser & Blair’s flexible work opportunity, we don’t ask you to sign any binding contracts or make any restrictive agreements. This means you can sell promotional products however you’d like and truly make your business your own. More importantly, it means you get to set your own schedule. Take advantage of Kaeser & Blair’s flexible work opportunity to make money when it’s convenient for you. Obviously, the more you work the more money you will earn. How much you make through our flexible work opportunity is determined by the amount of drive and motivation you have. With average profits at 20% of the selling price and average orders close to $785, Kaeser & Blair’s flexible work opportunity offers generous earning potential to part-time and full-time business owners. In fact, some of our business owners earn up to $100,000 or more every year. If you became a part-time business owner who joined Kaeser & Blair for its flexible work, then you could earn up to $7,000 to $20,000 yearly. If you wanted to make more, you could always work full-time and potentially earn an annual amount of $60,000 to $185,000. Since you are your own boss, you ultimately decide how much you can make through this flexible work opportunity. Interested in joining Kaeser & Blair’s flexible work opportunity? For a minimal start-up cost of $85, you’ll receive our Standard Business Owner Package. In it, you’ll find all the necessary tools to start this flexible work opportunity including our Best Buys Catalog, which more than 90% of our most successful business owners use to sell promotional products. Once you reach $1,500 in sales you get a full refund of your $85. And just in case you realize this flexible work opportunity isn’t for you, you can send us the starter kit back within 30 days to receive a full refund of your $85. Still not sure about joining this risk-free, flexible work opportunity? Try it out for free by requesting our Free Trial Launch Package.